The muscular system of the human body is indispensable for homeostasis. Specialized muscle types evolved over millions of years form the foundation of systems that monitor, detect, communicate, and react to keep the body healthy and in equilibrium. This type of muscle is under voluntary control and is attached to bones using tendons. When it contracts it moves individual bones or entire groups of bones to move the whole organism. This maintains homeostasis by allowing individual body parts to move (pulling away from a hot surface), or the entire body to move away from danger, hunt, capture food, or to mate. Smooth muscle is ubiquitous in the body. It lines the digestive system, the respiratory tract, the uterus, urinary bladder, and the walls of arteries and veins. All these systems are involved in maintaining homeostasis. Most smooth muscle is specialized to propel fluids, semi-solids, and solids by being a single-unit which means the entire muscle contracts or relaxes at one time. The digestive system moves food along its length using peristalsis, a wavelike movement of the intestinal wall that results from repeated contractions. In addition, smooth muscles in the eye allow pupils dilate and contract and alters the shape of the lens for focusing on objects. In the skin, smooth muscle causes the hairs on the skin to stand up in response to fear and cold temperatures. Unlike skeletal muscle, smooth muscle movement is involuntary. The heart contributes to homeostasis of the body of many ways including pumping blood to the tissues which contains oxygen and nutrients and propelling waste products like carbon dioxide to the lungs to be exhaled. In addition, control centers in the vessels and the brain help to modulate heart rate which is essential to maintaining the proper balance of nutrients and gases in the blood and tissues during exertion. The heart is also responsible for working with the kidneys to maintain blood pressure. 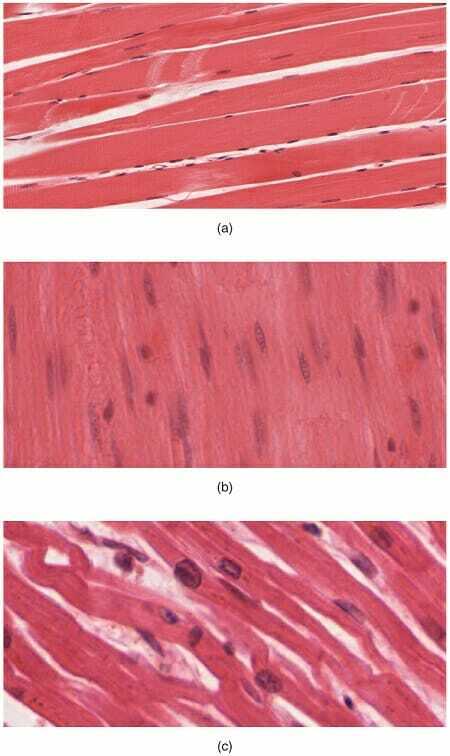 The image above shows the three types of muscle tissue as seen under the microscope: (a) skeletal, (b) smooth, and (c) cardiac.